Direct-acting solenoid valve, Model HKL5 is 12.6 mm wide, with 0.05 Cv flow rate, 1.8 W power consumption, and pressure rating from vacuum to 30 psig. It can be used as 2-way or 3-way NO/NC standard fill/exhaust valve, or as selector or diverter. Mounted on manifold or sub-base, diaphragm-poppet valve has no sliding seals, no metal-to-metal contact, and requires no lubrication. 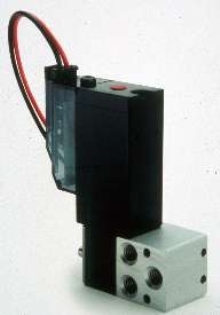 Solenoid features 12 or 24 Vdc isolated coil with response time of 0.010/0.004 ms. The Humphrey Model HKL5 Valve is designed to offer zero leakage in liquid and gas applications. This direct-acting solenoid valve is a compact 12.6mm wide, with a high 0.05 Cv flow rate, low 1.8 watt power consumption, a pressure rating from vacuum to 30 psig, and a working temperature range from 32° to +175°F. The valve features multiple porting configurations, can be used as a 2-way or 3-way, NO/NC standard fill/exhaust valve, or as a selector or diverter, and can be mounted on a manifold or a subbase, with custom Acrylic manifolds available upon request. The HKL5 features Humphrey's proven diaphragm-poppet valve design, which has no sliding seals, no metal-to-metal contact and requires no lubrication. The direct-acting solenoid has an isolated coil with minimal armature travel for a fast response time of 0.010/0.004 ms, and is available in 12 or 24VDC coil voltages. The valves are available in a range of porting options, including 10-32 UNF, 1/8" NPT, M3 and a cover for 5/32" tubing.